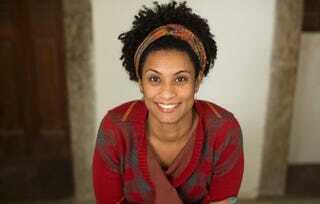 Marielle Franco, a black Brazilian councilwoman who fought for the rights of blacks, women and the poor, was viciously assassinated in Rio de Janeiro, Brazil on March 14 of last year. Now, almost a year later, Rio de Janeiro police have arrested two men they believe are responsible for killing Franco and her driver, Anderson Gomes, with 14 shots. But the public still doesn’t know who ordered the assassination of Franco. At 4 a.m. local time on Tuesday, police arrested Ronnie Lessa, 48, a retired police sergeant, and Elcio Vieira de Queiroz, former military police who had been expelled from the force. The public ministry says Lessa was responsible for the shooting while Queiroz was driving the vehicle from which the shots were fired. Lessa was arrested at his condominium in Rio de Janeiro’s Barra da Tijuca. Coincidentally, he lives in the same luxury condominium complex as Brazilian President Jair Bolsonaro. Investigators said there were three people in the car from which the shots were fired. According to prosecutors, the crime was “meticulously” planned three months before the attack. “It is undisputed that Marielle Francisco da Silva Franco was summarily executed because of her political actions in defense of the causes she defended. The barbarism practiced on the night of March 14, 2018, was a blow to the Democratic State of Law,” reads the official complaint against Lessa and Queiroz. Since their arrests, internet sleuths have unearthed photos of Lessa and Queiroz with President Bolsonaro. Investigators have not confirmed any relationship between the shooters and President Bolsonaro, who never paid homage to Franco during his presidential campaign last year. As a councilwoman from the Maré favela, Franco denounced the police brutality that favela residents, most of them black, regularly experienced. Her death touched so many people that supporters organized vigils and protests in more than 20 cities across Brazil. Most of those protests were against the genocide of black people in Brazil. For Afro-Brazilians, Franco proved that a black person from a favela could be educated, have dignity and also fight against the social injustice that black Brazilians suffer from every day. For women, she proved they could overcome sexism and machismo in Brazil. But her death is hitting Afro-Brazilian women, who suffer the most from Brazil’s violent, racist and sexist society, the hardest. Dozens of events and memorials are planned across Brazil and the world to honor Marielle Franco on March 14, the one year anniversary of her assassination. Kiratiana is a journalist based in Rio de Janeiro. She's currently writing a black travel and culture guide to Rio de Janeiro.